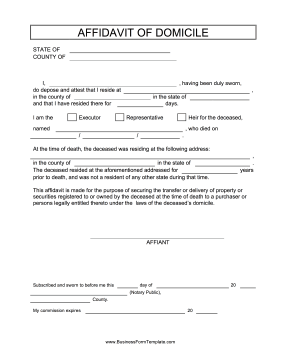 Executors and heirs for the deceased of an estate can use this free, printable affidavit of domicile for legal purposes. I, ____________________, having been duly sworn, do depose and attest that I reside at ____________________, in the county of ____________________ in the state of ____________________ and that I have resided there for ____________________ days. I am the _____ Executor _____ Representative _____ Heir for the deceased, named	____________________, who died on ____________________. At the time of death, the deceased was residing at the following address: ____________________, in the county of ____________________ in the state of ____________________. The deceased resided at the aforementioned address for ____________________	years prior to death, and was not a resident of any other state during that time. This affidavit is made for the purpose of securing the transfer or delivery of property or securities registered to or owned by the deceased at the time of death to a purchaser or persons legally entitled thereto under the laws of the deceased's domicile.